The full-depth velocity structure of the Agulhas Current at latitude 32°S has been measured seven times in total (4x pre-AUCE; 3x by this study). Each time an Undercurrent has been present, but of varying strength, size and depth. Prior to AUCE, a single time series measurement of nine months duration was all the information available on the variability of this Undercurrent. We learned that its mean velocity was 10 cm/s to the northeast, that it does not covary with the Agulhas Current above and that its average transport was estimated as 5 Sv. Thus, little was known about the Agulhas Undercurrent, only that it is a real and long-lived feature of the circulation. The primary reason that the Agulhas Undercurrent is of interest to oceanographers and climatologists is its potential role in the global thermohaline circulation. At 32°S it carries North Atlantic Deep Water (NADW) and Antarctic Intermediate Water (AAIW) northward. It is possible that there is a continuous current facilitating rapid inter-ocean exchange of NADW around the African Cape, since a slope current has also been observed off Cape Town. Even more significant is the recent observation of a northward current of AAIW and NADW in the Mozambique Channel, strongly indicating that the western boundary is indeed an important region for ventilation of the Indian Ocean. But without measurements, we can only speculate the Undercurrent's role. In addition to fundamental questions of its global importance, there are many specific questions about its dynamics to be addressed. With observations of undercurrents now made in the Gulf Stream, the Brazil, East Australia, Mozambique, Somali and Agulhas Currents, it seems likely that they are ubiquitous to western boundary current systems. What is the mechanism for this? How similar is the Agulhas Undercurrent to these other bottom trapped flows? Does it entrain waters, rise or deepen as it flows northward? Does its transport vary over time? Is its speed related to the steepness of the slope, and is it always attached to the slope? Does the Undercurrent conserve potential vorticity along its path? What happens to the north as the continental shelf widens and the Natal Valley shallows? Figure 1: CTDO2/LADCP stations (red dots) and the locations of the 3 subsurface moorings on the Port Shepstone line at 32°S (yellow diamonds). The Agulhas Undercurrent Experiment (AUCE) comprised an oceanographic survey off the east coast of South Africa between 28°S and 37°S and a moored array at 32°S (Fig. 1). The survey and mooring deployment were carried out on R/V Melville from 14 February to 17 March 2003. Four cross-stream sections were made at 30°S, 32°S, 34°S, and 36°S consisting of underway ADCP (Fig. 2) and closely spaced Conductivity-Temperature-Depth-Oxygen (CTDO2) and LADCP stations. Eight current meters were moored in the deep waters below and shoreward of the Agulhas Current at 32°S. Five instruments were retrieved in April 2005, with velocity and temperature time series of up to 26 months in duration. The goals of the survey were to examine the alongstream structure and evolution of the Agulhas Current System. The goals of the moored array were to measure the mean structure of the Undercurrent, obtain a more robust transport, establish whether there is a significant transport of intermediate as well as deep waters, and find the time scales and processes that dominate its variability. Figure 2: Ocean currents at 50 m measured by shipboard acoustic Doppler current profiler during AUCE. The Agulhas Current, the western boundary current with speeds exceeding 250 cm/s, is oriented southwestward, except at Richards Bay (30°S) where the continental slope topography guides it to the southeast around the Natal Bight. At the southernmost line, off Port Elizabeth (36°S), the current has detached from the slope. Results from the survey show that the water mass properties on either side of the dynamical core of the Agulhas Current are significantly different. Inshore of its velocity core are found waters of predominantly Arabian Sea, Red Sea, and equatorial Indian Ocean origin, while offshore waters are generally from the Atlantic, the Southern Ocean and the southeast Indian Ocean (Beal et al., 2006). For the most part, the inshore waters approach the Agulhas Current through the Mozambique Channel, while those offshore are circulated within the southern Indian Ocean subtropical gyre before joining the Current. These disparate water masses remain distinct during their 1000 km journey along the South African continental slope (Fig.3), despite the convergence, extreme velocity shears, and high eddy kinetic energies found within the Agulhas Current. We find that a high cross-stream gradient of potential vorticity is the dominant mechanism for water mass separation near the surface, while the kinematic steering of water particles by the Current is dominant at intermediate depths, where cross-stream potential vorticity is homogeneous. Hence, we suggest three lateral mixing regimes for the Agulhas Current. The surface and thermocline waters are always inhibited from mixing, by the presence of both a strong, cross-frontal potential vorticity gradient and kinematic steering. At intermediate depths mixing is inhibited by steering alone, and thus in this regime we expect periodic mixing during meander events (such as Natal Pulses), when the steering level will rise and allow cross-frontal exchange. Finally, below the steering level in the deep waters, there is a regime of free lateral mixing. The deep waters of the Agulhas Current are homogeneous in the cross-stream sense, being from the same North Atlantic source, and their salinity steadily (and rather rapidly) decreases to the north. Using an advective-diffusive balance for the deepest layer, where any reduction of salinity along the layer is asssumed to result from an upward diffusion of salt out of the layer, we estimate a large vertical mixing coefficient of order 10 cm2/s2. The mean advection is based on instantaneous velocity observations and may not be representative of the mean, and the estimated error in the diffusivity is large, about 200. Estimating the diffusivity from LADCP shear and CTD strain is better resolved and yields a value two orders of magnitude smaller, consistent with Garrett-Munk (Kunze et al., 2006). It is also possible that there is a strong lateral gradient in salinity farther offshore, in waters beyond our sampling grid, and that some salinity changes could be due to lateral advection and/or diffusion. It seems likely that there are recirculating flows due to the confines of the Natal Valley on at least the two northerly sections. 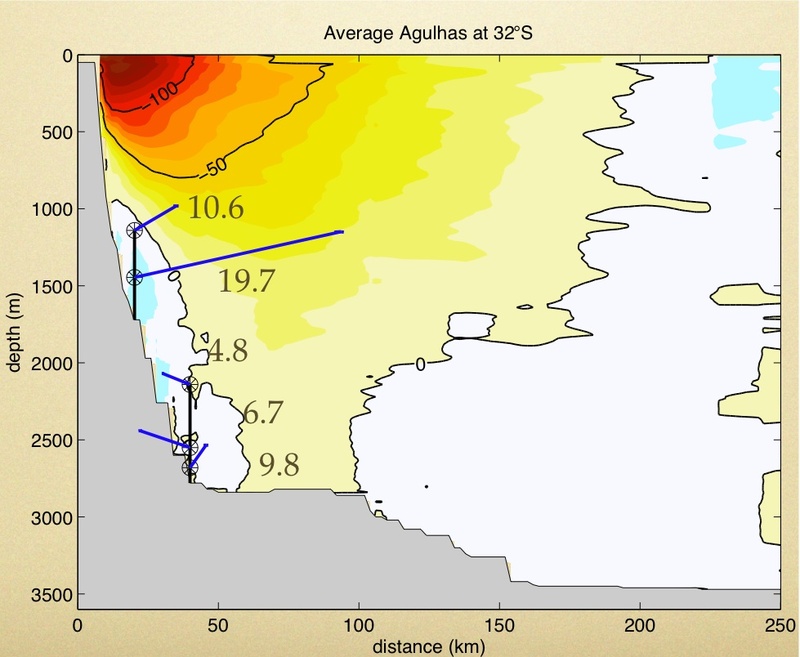 Figure 3: Potential temperature versus salinity diagrams depicting the water masses in the Agulhas Current System. The top 4 panels are for each of the four sections across the Agulhas Current and are color-coded red for positive relative vorticity (offshore of the current core) and blue for negative relative vorticity (inshore of the current core). The bottom panel shows the mean T/S curves from each section. Contours depict the neutral density surfaces that define the boundaries of the major water masses of the Agulhas Current System (Beal et al., 2006). The mooring data was only available to us in the last year of the project. Preliminary results show a bottom-intensified, topographically driven, highly variable Undercurrent. 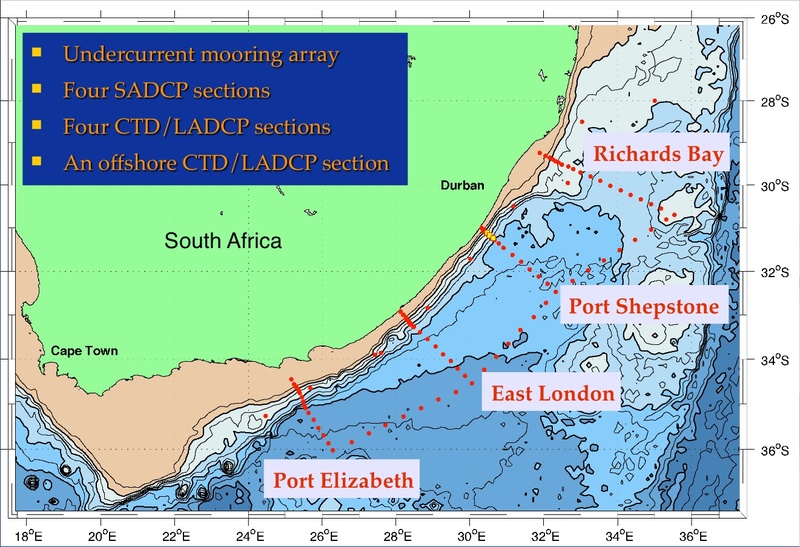 Maximum speeds of up to 50 cm/s occurred at 1400 m depth, almost directly below the mean position of the Agulhas Current core, and 300 m above the steep bottom of the continental slope. Here velocities averaged 20 cm/s, with a standard deviation of 24 cm/s, along a principal axis oriented 63° from north. The dominant periods of short-term variability in the Undercurrent are the semi-diurnal tide, a shear-modified inertial peak at 21.6 hrs, and peaks at 5.5 and 9 days within the topographic Rossby wave band. The most significant variance occurs at a period of 25 days, with a broader peak in energy between 40 and 60 days. Future work is aimed at considering mechanisms that might explain this variability and combining the time series data with the seven occupations of the Undercurrent to obtain a mean transport (Fig. 4). Figure 4: Mean Agulhas cross-track velocity section at 32°S based on 7 LADCP sections. Color contours are every 10 cm/s; black lines mark -100 cm/s, -50 cm/s, and 0 cm/s. Locations of AUCE current meters and mean vectors are superposed. This work was supported by NSF grant numbers OCE-0118318 and OCE-0244769. Beal, L. M., T. K. Chereskin, Y.-D. Lenn, and S. Elipot, 2006. The sources and mixing characteristics of the Agulhas Current. J. Phys. Ocean., 36(11), 2060-2074. Kunze, E., E. Firing, J. Hummon, T. K. Chereskin, and A. Thurnherr, 2006. 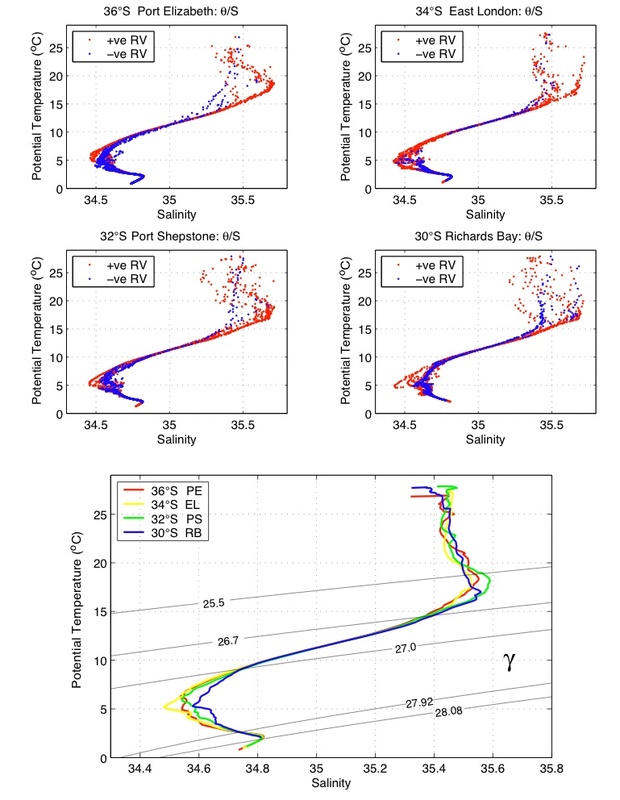 Global abyssal mixing inferred from lowered ADCP shear and CTD strain profiles. J. Phys. Oceanogr., 36(8), 1553-1576.